According to the 2013 NewFo Challenge it's time to tell you about the new project I started in February. I was hoping that before I started another new quilt I would be able to report at least one finish for this year, but that's not going to happen today. I could give you all my excuses, um I mean reasons, but I don't want to sound like I might have had the February blues or anything! The challenge for a retreat I'm going to in June is "Neutrals with a Kick" and since I need a baby quilt that month I decided to make a neutral baby quilt with stars. 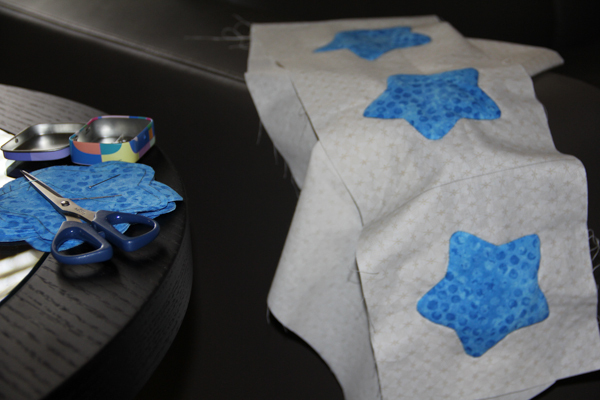 I appliqued bright blue stars onto 6" neutral squares. 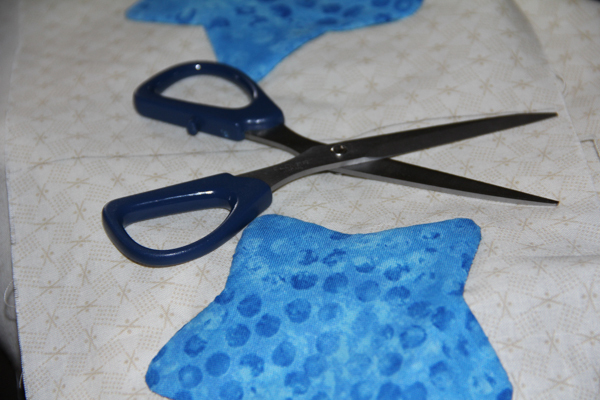 After I made eighteen of those I found out that this couple is not going to learn the gender of their baby, so I cut out eighteen bright pink stars for a second quilt. 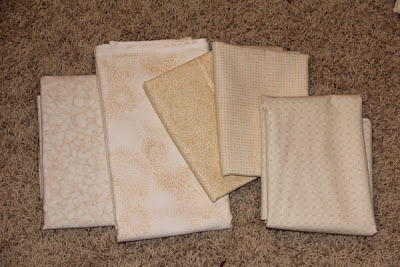 Here are some of the neutrals I pulled from my stash for the alternate blocks. I want to point out the scissors in this photo. They're cutwork scissors by Clover. I especially like them for applique because they have finely serrated blades which grip the fabric, keeping it from slipping and allowing you to cut cleanly. Having the right tools does make a big difference in the quality of one's work. I am linking up to Barbara's Linky Party then I am going to look at everyone else's site to see what they started in February!